Reforms of flats in Barcelona. Kitchens and bathrooms design. 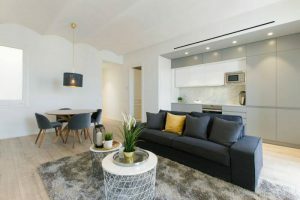 At Mako-mako we take care of renovating flats in Barcelona to ensure that your home looks like new. We have a specialist reformation team that only works with the best materials to give your home the look it deserves. If you want a comprehensive reform of your apartment, we are the company you are looking for. Contact us to ask for a quote. If you really like to cook, having an adequate space for it is a priority. At Mako-mako we design the best kitchens in Barcelona. 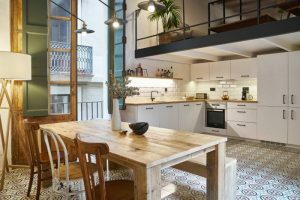 If you want to reform your kitchen in Barcelona, contact us. We open spaces, we change furniture, we reform walls and floors, and we help you decorate. 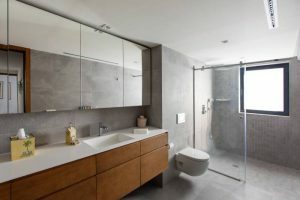 You should know that reforming your bathroom in Barcelona will significantly revalue your home and give you a much more comfortable and stress-free space. We design your bathroom to the highest standard with the highest quality materials so you feel a modern and relaxing air when entering. Start the day a whole new way by taking a shower in one of our renovated bathrooms. .